It’s hardly a secret that much of Southeast Asia is in drought, that Laos has bitterly upset its neighbors with its overly-ambitious dam construction plans, or that the once Western-backed Mekong River Commission (MRC) has been reduced to a shell of its former self. It’s a difficult situation, pushed along by a robust social debate and academic warnings about future water wars unless a reasonable effort can be spared to manage the Lower Mekong River Basin in an appropriate, sustainable way. It’s an issue that has dogged the subregion for the last five years. Thailand then stirred the pot by diverting the Mekong River to water surrounding dust bowls on Thai territory which has been severely punished by drought. Vietnam was furious while Cambodia, as always in these matters, has adopted a wait-and-see-approach. According to Vietnamese authorities Thailand had ignored “strong opposition from the regional and international public” and decided “on diverting the Mekong to bring water to drought-stricken areas in Thai territory”. Thai officials insisted what they took was small and would not impact on water levels. Nevertheless, Thi Thu Suu from the Vietnam River Network told local media that any diversion of the Mekong’s mainstream must include consultation and/or be allowed by MRC countries. 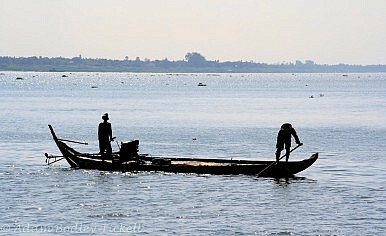 “They (Thailand) have to consult with MRC on the diversion project first, and then the Vietnam Mekong River Committee. Besides, it also has to consult with the community and involved parties,” she said. This Thailand did not do. The spat came as millions of Vietnamese farmers face major crop losses due to severe drought and salt water contamination of agricultural land in the Mekong Delta and its 12 Vietnamese provinces. Some reports say salt water contamination has reached the Cambodian border. Vietnam’s Agriculture and Rural Development Minister Cao Duc Phat said about 139,000 hectares of Vietnamese land had been contaminated to date and that number was expected to continue rising until the start of the next rainy season – often in June. “If the drought continues until June, some 500,000 hectares of the summer-autumn rice crop will not be able to begin on time,” Phat said, adding about 575,000 people were enduring fresh water shortages. “Even restaurants, hotels, schools, hospitals and factories in Ben Tre are running short of fresh water,” he added. Low rice yields are expected from the harvests across the subregion after last year’s severe droughts upset the regular planting seasons. The lack of rain has also resulted in lower than usual water in the Mekong River Basin in particular, leading to increased salt levels creeping in from the South China Sea. Rising salinity had also been foreshadowed in numerous reports dealing with climate change which the authorities in Hanoi are attempting to deal with. As a consequence of climate change, Hanoi had planned to spend $4.02 billion on irrigation and shoring-up water supplies between 2012 and 2020. Of that, $1.3 billion had been earmarked for expenditure between 2016 and 2020. But more importantly, the drought and rising salinity along with Thailand’s use and abuse of Mekong resources are two issues confronting an MRC which has been restructured with a seasoned Vietnamese diplomat, Pham Tuan Phan, installed at the helm. The Vientiane-Based agency, however, has only about a third of the $65 million it needs to fund its next five year plan after long-standing donors walked away amid widespread accusations of mismanagement. Donors were also upset by Lao government authorities keen to use their home advantage to push their plans for construction of 11 dams, including the Xayaburi which will block the mainstream of the Mekong River while the electricity it produces is to be sold into Thailand.